Over the last 16 or 17 years of professional email signature experience, I have found that my email signature has decreased in size over the years, from many lines to just a few. At the beginning of my successful professional career journey, trailblazing a path that would ultimately lead to success and bliss (this is a prediction), when I was a temp, I admit, I was young and naïve. At the time, and as I changed jobs every few months because I kept getting fired, I liked knowing there were 30 ways for people to reach me. Today, I try to limit those contacting options down to just the bare minimum. I do this because that’s what happens when you get older. Have you noticed that older people (39+) just want to be alone? They (45+) don’t like change or interference or telemarketers or spam or junk mail like I do at age 38. They’ve had enough of meaningless interactions with other humans (at 98+). They only want meaningful interactions with humans (at 100+). They want to sit in a chair staring at DirecTV all day long (at 110+). Why? Because they can (at 120+). The other reason I have taken lines out of my email signature is because no one faxes me out of the blue anymore. My feeling is that in 16 or 17 years, when I’m much closer to the DirecTV phase of my life (that’s a real thing), my work email signature will likely be just a few characters long, if not eliminated altogether. I have figured out a way to make the email signature meaningful again. It wouldn’t be the addition of an inspirational quote. No, the email signature would be much cooler if a contest or game went along with it. Then people might actually read it. More on that in my updated email signature below. 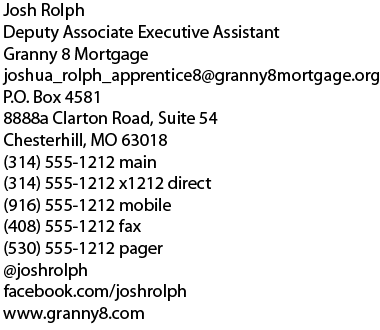 Speaking of Granny 8 Mortgage, the other night I was in St. Louis at a stop light, when I couldn’t help but notice a building with the company name “Granny 8 Mortgage” boldly displayed on one side of the building. The sign was all lit up. And that’s not all. An identical sign was boldly displayed on another side of the very same building, also brightly lit. I had to say the name of the company out loud. Now you say it. Out loud. Come on! Say it! I don’t care that you’re at a funeral. Make someone laugh. You’re sick. I hope you didn’t just say it at a funeral. For marketing purposes, that name works. I still remember it, as you can see. How many businesses have I driven by every day for five years that are akin to the commercials we see but don’t really see? Granny 8 Mortgage made an impression. I imagined a conversation at a party. What could I say? How could I respond to that? It’s like falling on ice in front of people before you actually fall on ice. It’s like the moment you start to slip. Everyone is watching so you overcorrect and make contorted facial expressions you never knew you could make and you know everyone will laugh with the inevitable fall that will make you look pathetic, careless and weak and you will never be able to take it back no matter how hard you try, reliving the moment frequently wishing you could just have a do over and start anew. I went to Granny 8 Mortgage’s website today and tried to find an about page explaining the significance of their name. After some digging, I found they opened in 1998 as Homestead Financial Mortgage.